Oliver Youth Cares recently presented Highway to Healing Support Society with a donation of $481.75! This money was raised through canteens and concessions at various high school sporting events. Youth Cares chose to raise funds for H2H as they collectively felt that it is so important to help families with children who are facing medical challenges. They would like to thank the community for supporting their fundraising efforts, and look forward to helping other worthy causes in our area! The H2H board of directors held their 2015 Annual General Meeting on January 29th at the Air Cadet Hangar. See full article and read President Ernie Dumais’ report here. The directors at Highway to Healing Support Society (H2H) would like to extend a sincere thank you to the community of Oliver and surrounding area for the support of our charity in 2014. To recap on our first full year of operations, we have assisted 6 different families this year with a child that needed to leave the Okanagan for medical reasons. Our assistance to these families was often more than once to accommodate repeated medical trips, but some were also one-time assistances. H2H provided assistance to these families in four ways: retroactively to cover families’ incurred expenses, immediately to cover emergency expenses, ahead of time in preparation for scheduled repeated needs, and by providing information about other supporting organizations to address needs outside of our scope. We want to recognize that this would not be possible without the generous support and donations from local organizations such as the Lions and Lioness’ Club, South Okanagan Health Care Auxiliary Society, Catholic Women’s League, ODN, The Trails Foundation, WOW, CFSOS, Youth Cares, The Rotary Club, all of our sponsors with the Michael Burgess in Concert fundraiser, and an overwhelming amount of private donations. This generosity is enabling us to be prepared and to have the funds necessary to be able to immediately help families in need. We look forward to continuing on this trajectory in 2015, and hope that your year was as great as ours! 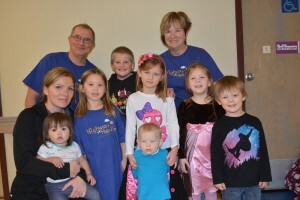 It was a gift to last for Highway to Healing when five-year-old Vienna von Burg (wearing blue H2H shirt) donated her birthday gifts to help families with sick children. In back from left are H2H director Ernie Dumais, Isaac Jones, and director Gail Barriskill. In middle from left are Brittany von Burg, Sydney von Burg (on lap), Vienna, Kadence Newstead, Abby Wolfe, and Landen Newstead. In front is Alexis Newstead. Photo: Lyonel Doherty. Tanya and Riley Martin (board members) accept cheque in the amount of $5000 – a donation to Highway to Healing (transportation costs for families in need). Announced tonight that the Hospital Auxiliary Thrift Shop organization to receive “Spirit of Oliver” group award at a ceremony Sunday. All donations receive tax credits. Highway to Healing, 2018. All Rights Reserved.